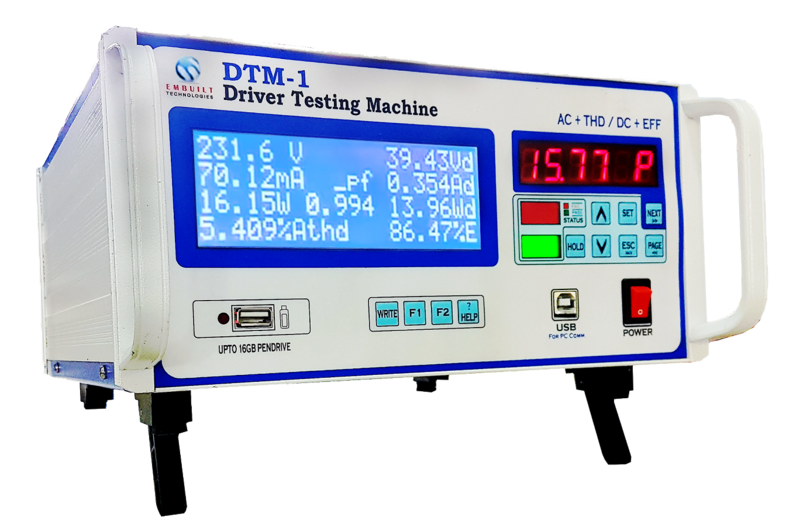 DTM-1 is AC-DC converter testing instrument with harmonics. It is made to increase the quality of LED drivers/SMPS/AC-DC Converters at production. It contains a big Blue moon display to show AC parameters (left) and DC parameters (right) on the main page. The USB port and Pen-drive port are also optically isolated with an internal circuit for the safety of user/operator. it also contains Bar Code facility for fast and easy testing. and generate datasheet with barCode number and measured parameters. It tests both AC and DC parameters with harmonics and efficiency. Main Page – Includes AC-DC parameters which are sufficient for production testing. DTM-1 has internal memory to save Production report without pen drive or computer. and the user can take saved data from DTM to Pen-drive by using a History command. It can store up to 32000 Tests in its internal memory. Saved data can transfer to pen drive for backup. Above page shows to transfer the ONBoard data (Internal Memory) to the pen drive. Pen drive based production and data logging with Serial No. Data logging with Bar code scan. Log on connect mode for automatic testing of led drivers with serial no and a date-time stamp. 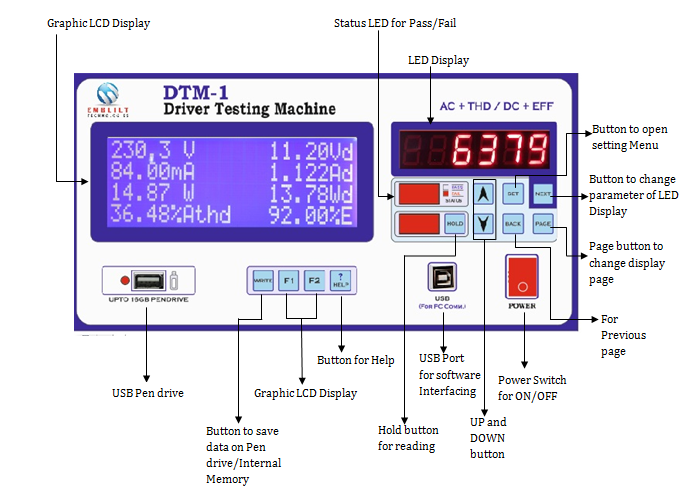 LED Driver test report in pdf format. LOC Fail option included or not included. Q1- What parameters it shows on the main page? Ans- It shows AC voltage, Current, Watt/PF, Current THD %, DC Volts, Current, Watt, and Efficiency on the main page. Other parameters are available by pressing the page button. Q2- What are the harmonics level it measures? Ans- It measures up to 55th harmonics of voltage and current. Q3- How many product models I can save in DTM-1? Ans- It saves up to 25 models in its internal memory. You can overwrite if you require. Q4- Can overwrite any model or limit in DTM-1? Ans -Yes. You can change/overwrite models saves in DTM-1 using DTM-1 software. Q5- If pen drive is provided then why do I require internal memory? Ans – Internal memory is useful for historical data as well as it makes sure you have a backup. Typically, You would like to work with internal memory and a supervisor could take data using a pen drive and process it further on his computer. Q6- Can I transfer the production data from DTM-1 internal memory to pen drive. Ans- Yes. DTM-1 has the option to transfer the data points to the pen drive. You can transfer last 1000 data points or 4000 data points to a pen drive. Q7- What is the format of pen drive data? Ans- Data saved in pen drive is in .CSV format which is easily openable in excel or notepad. Q8- How much data can I save in the pen drive? Ans- A pen drive can save millions of data points. Q9- What is maximum memory of pen drive it supports? Ans – It supports up to 16 GB Pendrive for logging. Q10- Can I set the display refresh rate in DTM-1? Ans – Yes. You can change the display refresh rate from 0.5 seconds to 2 seconds in the DTM-1. Q11- Can I set and auto-change the serial number in production testing? Ans – Yes. You can edit the serial number in DTM-1. Ans – You can use Grouped Test and select value 3 for it in setting menu. You will get an auto increment of serial number with A/B/C. For example 3 Consecutive readings with 2893A, data, 2893B, data, 2893C, data with auto increment option. Q13- What input source should I provide? Ans – Normally you can work on AC power Supply with Variac. If Input THD at your location is high then you may provide a sine wave UPS/Inverter. Q14- I want to do testing without touching DTM-1. Is there any option to do this in DTM-1? Ans- Yes. DTM-1 has Log on Connect facility. You can set the LOC ON/ OFF time and serial number once. Then You can do testing without touching DTM-1. It will log the data and increment serial number automatically when any load connects and disconnect to it. Q15- Is DTM-1 indicate the PASS/FAIL status on testing? Ans – Yes. DTM-1 indicates FAIL result by blinking a status LED. It also displays PASS/Fail on LCD Display. Buzzer facility is provided for PASS/FAIL. Q16- Can I do data logging in DTM-1? Ans – Yes. DTM-1 has data logging facility on the pen drive. You can set the data logging period and set the application as data logging. Q17- Can I measure parameters of a product save with barcode? Ans – Yes. DTM-1 has data logging facility with Barcode. You can make the setting of the barcode scanner and logging data with the barcode number.